In this game, participants are given endowments of tokens that may either be kept or contributed to a public good. Each token has a specified value if kept, but the value if contributed depends on others' contributions. If the total contributions exceed a pre-announced target level, then the public good is provided and each person receives a fixed monetary reward, regardless of whether or how much they contributed. 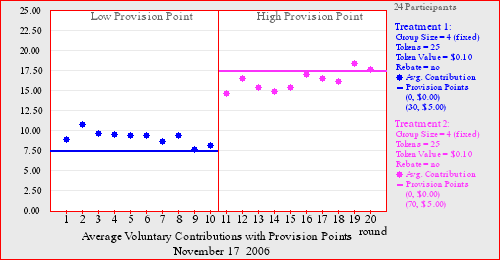 So individual investment is costly, but it may pay off if it pushes the total contribution above the "provision point." If the provision point is not reached, then contributions are either refunded or not, depending on the setup option that you select. Notice that the provision point introduces a "step" in the payoff function, and multiple provision-point steps are permitted. The discrete nature of the step-function payoffs is motivated by the discrete nature of some public goods, e.g. whether or not a park is provided. Provision points may (in some cases) provide a solution to the "free riding" that generates inefficiently low levels of public good provision, a problem that has been on economists' minds at least since Adam Smith's famous observations about street lights.